Martin Shkreli, the pharmaceutical executive who was vilified for raising the price of one of his company's drugs by more than 5,000%, has just taken over another biotech firm. KaloBios, a developer of cancer drugs, named Shkreli CEO and chairman late Thursday. Shares of KaloBios (KBIO) surged more than 400% on Thursday after the company announced that an investment group led by Shkreli purchased a majority stake in the struggling company. The stock soared another 75% Friday. Just last week, KaloBios said it planned to liquidate. Earlier this month, KaloBios announced plans to lay off 17 workers (61%) of its staff. Shkreli said in a press release that he had high hopes for lenzilumab, a KaloBios drug that will soon go into clinical trials with patients suffering from chronic myelomonocytic leukemia. And in a tweet Friday morning. Shkreli said that he was excited to save the company and that he planned to hire back the workers who were let go. So happy to rescue $KBIO from having to discontinue our promising blood cancer drug lenzilumab. Let's hire the downsized employees back too! Shkreli and his investment group have also agreed to invest at least $3 million in the company and that there's a commitment for another $10 million in financing as well. KaloBios said that it will be run separately from Shkreli's other firm, privately held Turing Pharmaceuticals. Shkreli founded Turing after he was ousted as CEO of another biotech that he started, Retrophin (RTRX), last year. Retrophin has since sued Shkreli, accusing him of misusing the company's cash and stock. Shkreli has denied the allegations. Shkreli, a former hedge fund manager, became the poster child for greedy drug companies when Turing announced earlier this year that it was raising the price of Daraprim, a drug used by AIDS patients, from $13.50 a pill to $750. Turing reported last week that the company has lost nearly $28 million during the first nine months of the year. But another company, Imprimis Pharmaceuticals (IMMY), is selling a Daraprim alternative for just $1 a pill. 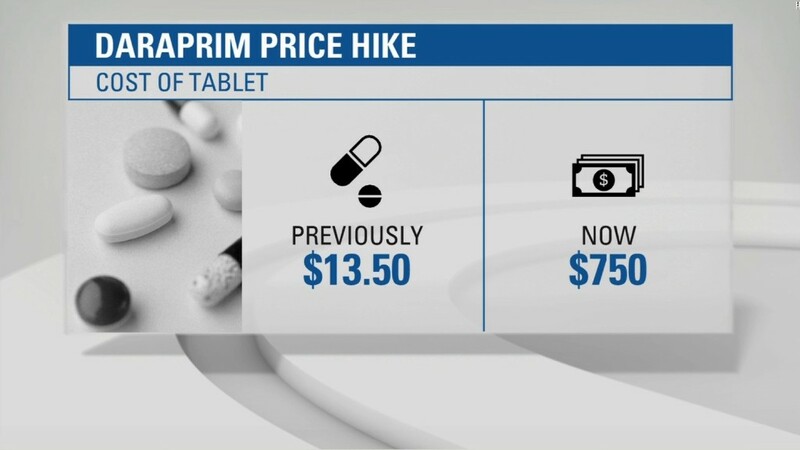 Shkreli has since vowed to lower the price of Daraprim. But he continues to be demonized on social media. The news of Shkreli's investment in KaloBios was met on Twitter with some predictable pleas for him to not jack up the price of its drugs. @MartinShkreli let the 5000% price increase begin! Time to screw the cancer victims!!!! But to be fair to Shkreli, there is nothing for him to raise prices on just yet. KaloBios has no drugs currently on the market and has not recorded any revenue from product sales. The only revenue in the company's history came from funding for research and development and licensing fees from drug giants Sanofi (SNY)and Novartis (NVS). KaloBios had previously tried to develop drugs to treat asthma and cystic fibrosis that did not pan out. "The stock is a circus right now. The company has missed on everything they've ever tried," said Brad Loncar, a biotech investor who runs the Loncar Cancer Immunotherapy ETF (CNCR). Loncar does not have a position in KaloBios. But he thinks that Shkreli's investment in the company could pay off big for him if the new leukemia drug does wind up working. "He's rolling the dice on a project that is worth rolling the dice on," Loncar said. Shkreli was not immediately available for comment for this story.